Introduction: Transcutaneous electrical nerve stimulation (TENS) is a non-pharmacological intervention clinically used for pain relief. The importance of utilizing the adequate stimulation intensity is well documented; however, clinical methods to achieve the highest possible intensity are not established. Objectives: Our primary aim was to determine if exposure to the full range of clinical levels of stimulation, from sensory threshold to noxious, would result in higher final stimulation intensities. A secondary aim explored the association of pain, disease severity, and psychological variables with the ability to achieve higher final stimulation intensity. Methods: Women with fibromyalgia (N=143) were recruited for a dual-site randomized controlled trial – Fibromyalgia Activity Study with TENS (FAST). TENS electrodes and stimulation were applied to the lumbar area, and intensity was increased to sensory threshold (ST), then to “strong but comfortable” (SC1), then to “noxious” (N). This was followed by a reduction to the final stimulation intensity of “strong but comfortable” (SC2). We called this the Setting of Intensity of TENS (SIT) test. Results: There was a significant increase from SC1 (37.5 mA IQR: 35.6–39.0) to SC2 (39.2 mA IQR: 37.1–45.3) (p<0.0001) with a mean increase of 1.7 mA (95% CI: 1.5, 2.2). Linear regression analysis showed that those with the largest increase between SC1 and N had the largest increase in SC2–SC1. Further, those with older age and higher anxiety were able to achieve greater increases in intensity (SC2–SC1) using the SIT test. Conclusion: The SC2–SC1 increase was significantly associated with age and anxiety, with greater mean increases associated with older age and higher anxiety. Thus, although all patients may benefit from this protocol, older women and women with elevated anxiety receive the greatest benefit. Pain is a universal human experience. The therapeutic reduction of pain can be addressed with pharmacological and non-pharmacological interventions. Non-pharmacological strategies are advantageous when pain is no longer protective, and the goals of patients and clinicians include avoidance of the undesirable side effects of pain medication. Transcutaneous electrical nerve stimulation (TENS) is a non-pharmacological intervention that activates the endogenous opioid system in the peripheral and central nervous systems to reduce pain.1,2 Prior randomized controlled trials (RCTs) and clinical trials have shown that TENS reduces pain,3–5 pain medication intake, and side effects,6–9 and improves function5,6,10–12 in both acute13 and chronic3,4 pain conditions. The evidence for the clinical use of TENS may appear conflicting. However, it is becoming increasingly evident that when TENS is dosed correctly8,14–16 and the proper outcome measures are utilized, such as pain with movement,5,12 TENS is effective. Commercially available TENS units provide options to adjust several parameters including stimulation frequency, pulse duration, and stimulation intensity. Data show different mechanisms of action between low-frequency (LF) and high-frequency (HF) TENS, with LF TENS activating µ-opioid receptors and HF TENS activating δ-opioid receptors1,2,14,17 – both are effective in reducing pain when given at adequate intensities.3 There is no difference in analgesia when varying pulse duration if an adequate stimulation intensity is used.11 Conversely, the stimulation intensity is a critical variable to obtain adequate analgesia.3,16,18,19 In fact, in healthy controls, increasing intensity results in a dose-dependent hypoanalgesia16 with a strong but comfortable or the highest tolerable intensity necessary to obtain analgesia.16,18,19 Similarly in people with pain, TENS delivered at “strong but comfortable” or higher intensity is effective, whereas TENS delivered at lower intensity is ineffective.5,8,11 Thus, the methods to achieve a greater level of stimulation intensity could improve TENS effectiveness. Limiting factors in achieving adequate TENS intensity could be patient-related such as pain severity, disease severity, or psychological variables. In people with fibromyalgia, there is a greater sensitivity to all sensory stimuli.20 Theoretically, those with severe pain or disease could have poor tolerance to electrical stimulation. Fear of pain predicts pain threshold, but not pain tolerance in healthy controls21,22 and clinical pain intensity in patients with musculoskeletal pain.23 Increased pain catastrophizing and anxiety are associated with increased pain and reduced pain thresholds.24,25 In fact, Rakel et al previously demonstrated in an RCT for postoperative pain following total knee replacement that individuals who scored high on anxiety and pain catastrophizing had less reduction in pain with TENS than those who scored low on these psychological constructs.26 It could be that the individuals with higher anxiety and pain catastrophizing achieved a lower stimulation intensity. Thus, examining the relationships between psychological variables and the ability to achieve an adequate stimulation intensity could improve outcomes. The primary aim of the current study was to determine whether exposure to the full range of clinical levels of stimulation (sensory threshold, strong but comfortable, and noxious) would result in higher final stimulation intensities in women with fibromyalgia. It was hypothesized that the subject’s final “strong but comfortable” rating (SC2) would be greater than their initial “strong but comfortable” rating (SC1). A secondary aim was to examine whether age, body mass index (BMI), measures of pain severity, disease severity, and psychological variables were associated with a subject’s ability to achieve a higher final stimulation intensity. This is an analysis of baseline data from an ongoing clinical RCT investigating the effects of TENS in women with fibromyalgia – the Fibromyalgia Activity Study with TENS (FAST; NCT01888640). The data were collected at the first and second visits of a four-visit protocol and prior to randomization to the study intervention. This study was approved by the Human Subjects Review Board at the University of Iowa and Vanderbilt University Medical Center. Subjects were advised that a test would be conducted to check their response to TENS. This SIT test was described as being different from the TENS treatments that would follow for the remainder of the study. A standardized script was used to conduct the test. A large 4″×7″ butterfly electrode (Empi Inc/DJO Global, Vista, CA, USA) was used to cover a greater surface area. The electrode was applied to water-cleaned skin over the lumbar paraspinal musculature between L1 and L4. The Empi Select TENS unit (Empi Inc/DJO Global), which uses an asymmetrical biphasic alternating current, was connected to the electrode and set in the continuous mode (pulse duration 100 µs, pulse frequency 50 Hz). TENS intensity was increased slowly, and subjects were instructed to indicate sensory threshold (ST); then, the intensity was increased until the sensation was perceived as “strong but comfortable” (SC1). Intensity was then increased to the point deemed “noxious” (N) by subjects, followed with a decrease in intensity until the stimulus was again characterized as “strong but comfortable” (SC2). Subjects were asked if they felt any muscle twitching at the SC2 intensity, and the examiner visually inspected or palpated the site to verify this response. Intensity (in mA) was recorded at each level of stimulation. For the purpose of analyses, we defined the maximal intensity increase as (N–SC1) and the attained comfortable increase as (SC2–SC1). Descriptive statistics for subject characteristics and TENS stimulation intensities (SC1, N, and SC2) were calculated for the entire cohort. 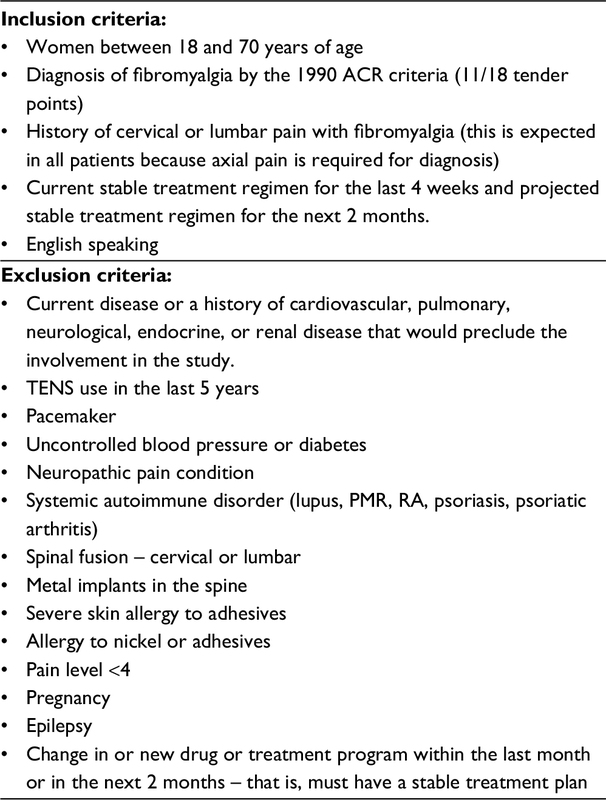 Validated criteria were used, when available, to define the categories of patient characteristics (Table 1). Categories for age were by decade. NRS pain scores were classified as moderate pain (4–6) and severe pain (>7).26 Categories for BMI were determined based on the accepted definition of underweight/ normal (<25), overweight (25–30), obese (30–35), and morbidly obese (>35).29 The PROMIS modules for depression and anxiety were categorized into normal and abnormally high, defined as greater than 1 SD above the general population mean.30 The PCS was categorized based on the sample of injured workers, described in the PCS user’s manual,31 population percentiles into low (<25th percentile, <10), medium (26th–74th percentile, 10–30), and high (≥75th percentile, >30). Based on a pooled analysis of data from 2,000 people with fibromyalgia, the FIQR was categorized into low (<40), medium (40–60), and high (>60).32 Preliminary analyses showed no relationship between opioid status and SC2–SC1 intensity differences, and this was not included in the analysis. Abbreviations: BMI, body mass index; FIQR, the Revised Fibromyalgia Impact Questionnaire; NRS, Numeric Rating Scale; PCS, Pain Catastrophizing Scale; PROMIS, Patient-Reported Outcomes Measurement Information System. To test our first hypothesis, the Wilcoxon signed-rank test was used to compare the intensities for SC1 and SC2. To test our second aim, Pearson’s correlation coefficients were calculated between TENS intensity levels and subject characteristics, using the absolute values for age, BMI, NRS pain severity, FIQR, PROMIS Depression, PROMIS Anxiety, and PCS. Linear regression – with an attained comfortable increase (SC2–SC1) as the dependent variable and a maximal intensity increase (N–SC1) as the independent variable – was conducted to estimate the mean attained comfortable increase as a function of the maximal intensity increase during the SIT test. Further linear regressions were conducted to examine the moderating effect of patient characteristics on the response to the SIT test. This was done by including the subject variable in the regression of attained comfortable increase with maximal intensity increase. To assess for moderating effect, an interaction effect (subject variable)*(maximum intensity increase) was included and tested in the regression model. For subject characteristics with significant moderating effects, post hoc analyses were used to compare the slopes between categories. All statistical analyses were conducted using SAS Version 9.4 statistical software (SAS Institute Inc, Cary, NC, USA). Subject demographics and clinical variables are presented in Table 1. The mean (SD) value was 50.2 (11.0) years for age and was 33.5 (8.0) kg/m2 for BMI. Forty-eight of 143 subjects (34%) were taking an opioid medication. For our sample, the median (IQR) for resting pain was 6 (4–7) and subjects had an average FIQR score of 56.3 (17.1), indicating that they had moderate severity of fibromyalgia symptoms.32 The average PROMIS Depression score was 56.6 (8.5) and the anxiety score was 57.6 (8.2), with 31% and 39% presenting with depressive or anxiety symptoms, respectively.32 The mean PCS score for subjects was 20.5 (13.2), with 28% showing moderate to severe pain catastrophizing.31 The variability in the sample size for these data is due to not all subjects completing Visit 2 because of not meeting the eligibility criteria or subject attrition. Table 2 shows the TENS intensity data for all subjects. The median TENS intensity attained was 37.5 (IQR: 35.6–39.0) mA for SC1, 40.4 (38.4–46.3) mA for N, and 39.2 (37.1–45.3) mA for SC2, with a median maximal intensity increase of 3.5 (range 0–24.1) mA. There was a significant increase from SC1 to SC2 (p<0.0001), with a median attained comfortable increase of 1.7 mA (95% CI: 1.5, 2.2). There was a wide range of the individual differences in intensity between SC1 and SC2 (range −9 to 24.1 mA), with 30.1% having an increase of ≥5 mA and 12.6% having an increase of ≥10 mA. In addition, 24.5% of the subjects had a decrease in the TENS intensity from SC1 to SC2, ranging from 0 to −9 mA. The SC1 intensities of those who had <5 mA change in SC1 to SC2 (37.7±5.9 mA) were similar to those that had a ≥5 mA change in SC1 to SC2 (37.9±4.7 mA). Linear regression to estimate the mean attained comfortable increase as a function of the maximal intensity increase (intercept: −1.65; slope 0.98) resulted in an increase between 3.2 mA (95% CI: 2.9, 3.5) and 21.8 mA (95% CI: 20.8, 22.7) for those with a maximal increase between 5 and 24 mA, respectively (Figure 1A). Abbreviation: TENS, Transcutaneous electrical nerve stimulation. Figure 1 Regression of the difference in TENS intensities (mA) between “strong but comfortable 1” and “strong but comfortable 2” (SC2–SC1) on the difference between “strong but comfortable 1” and “noxious” for the lumbar region in (A) all subjects with fibromyalgia. Regression of the difference in TENS intensities (mA) between “strong but comfortable 1” and “strong but comfortable 2” (SC2–SC1) on the difference between “strong but comfortable 1” and “noxious” for the lumbar region in subjects with fibromyalgia by categories for (B) age, (C) PROMIS Anxiety with significant differences in slope, and (D) PCS with a nonsignificant difference. Abbreviations: PCS, Pain Catastrophizing Scale; PROMIS, Patient-Reported Outcomes Measurement Information System; TENS, Transcutaneous electrical nerve stimulation. Contrary to our second aim, a direct relationship between subject variables and SC1, SC2, or N (p>0.05) was absent. 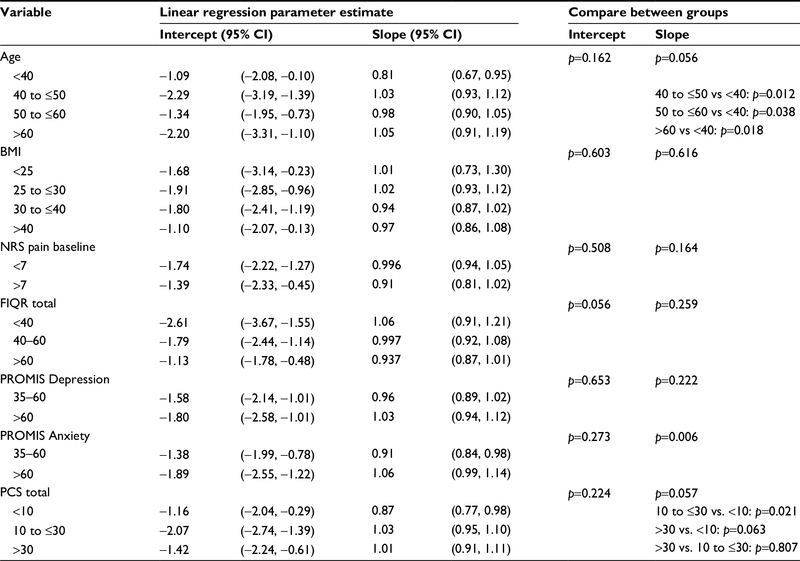 There were no significant correlations between subject variables of age, BMI, pain, FIQR, PROMIS Depression, PROMIS Anxiety, or PCS and level of SC1, SC2, or N. Correlations ranged from 0.0 to 0.2, and the upper limit of the 95% CI was 0.33 (Table 3). Abbreviations: BMI, body mass index; FIQR, the Revised Fibromyalgia Impact Questionnaire; NRS, Numeric Rating Scale; PCS, Pain Catastrophizing Scale; PROMIS, Patient-Reported Outcomes Measurement Information System; TENS, Transcutaneous electrical nerve stimulation. Linear regression analysis to examine the moderating effect of subject characteristics on the response to the SIT test showed significant differences in slopes for the categories of age and anxious symptoms (Table 4). The older age groups (40–50, 50–60, and >60 years) had a greater slope than those under 40 years (Figure 1B). Subjects in the high anxiety group had a higher slope compared to those who scored within the normal range of anxiety on the PROMIS module (Figure 1C). There was no significant moderating effect of pain catastrophizing (PCS, p=0.057; Figure 1D), resting pain severity (p=0.164), BMI (p=0.616), disease severity (FIQR, p=0.259), depressive symptoms (p=0.222). (Table 4, Figure 2A–D). Figure 2 Regression of the difference in TENS intensities (mA) between “strong but comfortable 1” and “strong but comfortable 2” (SC2–SC1) on the difference between “strong but comfortable 1” and “noxious” for the lumbar region for variables with nonsignificant differences in slope between categories include (A) NRS pain at baseline, (B) BMI, (C) FIQR, and (D) PROMIS Depression. Abbreviations: BMI, body mass index; FIQR, the Revised Fibromyalgia Impact Questionnaire; NRS, Numeric Rating Scale; PROMIS, Patient-Reported Outcomes Measurement Information System; TENS, Transcutaneous electrical nerve stimulation. The current study showed that exposure to the full range of TENS stimulation intensities from sensory threshold to noxious using the SIT test resulted in a greater final intensity of TENS characterized as “strong but comfortable”. The study further showed that women who were older or had higher anxiety were most likely to benefit from using the SIT test, as indicated by the attained change between SC2 and SC1 being similar to the maximum possible change between N and SC1. Whereas the current data support our hypothesis that exposing women with fibromyalgia to the full range of TENS intensities increases the final stimulation intensity, the statistically significant median change of 1.7 mA for the entire patient sample may not be clinically relevant. However, this difference ranged from −9 to 24 mA, and 43% of subjects achieved an increase of at least 5 mA – a clinically meaningful difference in intensity. Thus, this method may be more useful for a subpopulation of individuals. Our second aim sought to determine whether measures of pain severity, disease severity, and psychological variables were correlated with a subject’s ability to achieve higher final stimulation intensity. Interestingly, the current study showed no significant correlations of the clinical level of stimulation (SC1, SC2, and N) and patient characteristics. However, perceptions of stimulation are quite variable at each intensity level and are related to a number of conditions including skin characteristics such as impedance, temperature, and hydration,33–35 and neural characteristics such as sensory and nociceptive thresholds.36 For this reason, stimulation intensity is variable and routinely set by patient perception, making the intensity comparison between groups difficult. To achieve a common point of comparison between groups, we examined the relationship between two change scores (SC2–SC1 and N–SC1). This allowed us to analyze if the SIT test would enable the subjects to approach their self-appointed maximum intensity level (noxious). We showed a strong correlation between these two measures, suggesting those with the largest difference between SC1 and N intensity were able to show the greatest increase between SC1 and SC2. Further, we showed that those with increased age and increased anxiety were able to show greater increases using the SIT test. In addition, the SIT test may be beneficial for patients who do not choose a very high initial stimulation intensity. Subjects with elevated anxiety demonstrated the greatest increases in “strong but comfortable” intensity when exposed to the SIT test. Anxiety is important to assess in this population because 13%–64% of persons with fibromyalgia have concurrent anxiety.44 Patients with elevated anxiety may approach a new treatment, such as TENS, with caution to preemptively avoid potentially noxious stimuli due to feared harm. Rakel et al previously showed that those with increased anxiety were less responsive to TENS after total knee replacement.26 It is possible that these subjects had a lower intensity of TENS when compared to those without anxiety. As intensity is critical to effectiveness of TENS,3,16,18,19 these subjects could have presented with reduced effectiveness. The current study shows that those with the highest levels of anxiety displayed the greatest ability to attain SC2 intensity closest to their maximal tolerated (N) TENS intensity. The SIT test could be considered an exposure-based therapy. Exposure therapy is used to treat anxiety and aims to help people confront their fears by altering the expectancy of harm.45–47 Exposure-based techniques may be useful for those who are anxious about TENS – that is, trait anxiety – by allowing them to experience the range of non-painful stimulation. Commonly, psychological approaches are utilized in chronic pain intervention for goals of increasing activity and exercise. Non-harmful stimuli that increase the activity are used to demonstrate that the feared activity will not cause harm.48 The SIT test described in this manuscript may provide a mechanism to increase intensities of stimulation in those with high anxiety by exposing subjects to the feared stimulation and providing a non-harmful experience. Interestingly, none of the subject characteristics assessed (age, BMI, measures of pain severity, disease severity, and psychological variables of depression, anxiety, and catastrophizing) negatively impacted the ability of subjects to achieve the greatest increase in stimulation intensity. It is possible that BMI did not impact increases in stimulation intensity because the majority of subjects were considered obese (62%) or overweight (24%). Overall, this suggests that clinicians can be confident in the application of the SIT test to women with fibromyalgia. Our overall hypothesis that exposure to the full range of electrical stimulation intensities resulted in subjects choosing a higher level is an important finding – because whereas encouraging higher stimulation intensity for pain management is desired, we find no documented methods for clinically addressing this issue. Resting pain, BMI, disease severity (FIQR), pain catastrophizing (PCS), and depression were not the predictors of the change between SC1 and SC2. This suggests that pain and its related symptoms do not directly influence the precise level of TENS stimulation intensity. It is unclear, however, what factors will be predictors of TENS effectiveness in women with fibromyalgia, or if the ability to achieve the greatest change in intensity between SC1 and SC2 is related to TENS effectiveness. Additional analysis of these subjects after completion of the clinical trial will determine the effectiveness and utility of this TENS intensity test. This research was supported by grant nos. NIH UM1 AR063381 and NIH UM1 AR063381-S1, as well as by the CTSA award No. UL1TR000445 from the National Center for Advancing Translational Sciences to Vanderbilt University Medical Center. The sponsors had no involvement in any stage from the study design to the submission of this paper for publication. CGTV, DLD, BAR, LJC, and KAS contributed to conception and design; DLD, KMG, JMW, and LAM undertook data acquisition; CGTV, RLC, KH, MBZ, ENM, LJC, and KAS conducted data analysis and interpretation; CGTV, RLC, KH, and KAS drafted the manuscript; and CGTV, RLC, DLD, KH, MBZ, KMG, JMW, ENM, LAM, BAR, LJC, and KAS critically revised the manuscript. All authors contributed toward data analysis, drafting and revising the paper and agree to be accountable for all aspects of the work. Sluka KA, Deacon M, Stibal A, Strissel S, Terpstra A. Spinal blockade of opioid receptors prevents the analgesia produced by TENS in arthritic rats. J Pharmacol Exp Ther. 1999;289(2):840–846. Kalra A, Urban MO, Sluka KA. Blockade of opioid receptors in rostral ventral medulla prevents antihyperalgesia produced by transcutaneous electrical nerve stimulation (TENS). J Pharmacol Exp Ther. 2001;298(1):257–263. Vance CG, Dailey DL, Rakel BA, Sluka KA. Using TENS for pain control: the state of the evidence. Pain Manag. 2014;4(3):197–209. Johnson M, Martinson M. Efficacy of electrical nerve stimulation for chronic musculoskeletal pain: a meta-analysis of randomized controlled trials. Pain. 2007;130(1–2):157–165. Rakel B, Frantz R. Effectiveness of transcutaneous electrical nerve stimulation on postoperative pain with movement. J Pain. 2003;4(8):455–464. Freynet A, Falcoz PE. Is transcutaneous electrical nerve stimulation effective in relieving postoperative pain after thoracotomy? Interact Cardiovasc Thorac Surg. 2010;10(2):283–288. Wang B, Tang J, White PF, et al. Effect of the intensity of transcutaneous acupoint electrical stimulation on the postoperative analgesic requirement. Anesth Analg. 1997;85(2):406–413. Bjordal JM, Johnson MI, Ljunggreen AE. Transcutaneous electrical nerve stimulation (TENS) can reduce postoperative analgesic consumption. A meta-analysis with assessment of optimal treatment parameters for postoperative pain. Eur J Pain. 2003;7(2):181–188. Lan F, Ma YH, Xue JX, Wang TL, Ma DQ. Transcutaneous electrical nerve stimulation on acupoints reduces fentanyl requirement for postoperative pain relief after total hip arthroplasty in elderly patients. Minerva Anestesiol. 2012;78(8):887–895. Law PP, Cheing GL, Tsui AY. Does transcutaneous electrical nerve stimulation improve the physical performance of people with knee osteoarthritis? J Clin Rheumatol. 2004;10(6):295–299. Sluka KA, Bjordal JM, Marchand S, Rakel BA. What makes transcutaneous electrical nerve stimulation work? Making sense of the mixed results in the clinical literature. Phys Ther. 2013;93(10):1397–1402. Dailey DL, Rakel BA, Vance CG, et al. Transcutaneous electrical nerve stimulation reduces pain, fatigue and hyperalgesia while restoring central inhibition in primary fibromyalgia. Pain. 2013;154(11):2554–2562. Sbruzzi G, Silveira SA, Silva DV, Coronel CC, Plentz RD. Transcutaneous electrical nerve stimulation after thoracic surgery: systematic review and meta-analysis of 11 randomized trials. Rev Bras Cir Cardiovasc. 2012;27(1):75–87. Léonard G, Cloutier C, Marchand S. Reduced analgesic effect of acupuncture-like TENS but not conventional TENS in opioid-treated patients. J Pain. 2011;12(2):213–221. Liebano RE, Rakel B, Vance CG, Walsh DM, Sluka KA. An investigation of the development of analgesic tolerance to TENS in humans. Pain. 2011;152(2):335–342. Moran F, Leonard T, Hawthorne S, et al. Hypoalgesia in response to transcutaneous electrical nerve stimulation (TENS) depends on stimulation intensity. J Pain. 2011;12(8):929–935. Pantaleão MA, Laurino MF, Gallego NL, et al. Adjusting pulse amplitude during transcutaneous electrical nerve stimulation (TENS) application produces greater hypoalgesia. J Pain. 2011;12(5):581–590. Rakel B, Cooper N, Adams HJ, et al. A new transient sham TENS device allows for investigator blinding while delivering a true placebo treatment. J Pain. 2010;11(3):230–238. Geisser ME, Glass JM, Rajcevska LD, et al. A psychophysical study of auditory and pressure sensitivity in patients with fibromyalgia and healthy controls. J Pain. 2008;9(5):417–422. Lee JE, Watson D, Frey-Law LA. Psychological factors predict local and referred experimental muscle pain: a cluster analysis in healthy adults. Eur J Pain. 2013;17(6):903–915. George SZ, Dannecker EA, Robinson ME. Fear of pain, not pain catastrophizing, predicts acute pain intensity, but neither factor predicts tolerance or blood pressure reactivity: an experimental investigation in pain-free individuals. Eur J Pain. 2006;10(5):457–465. George SZ, Hirsh AT. Psychologic influence on experimental pain sensitivity and clinical pain intensity for patients with shoulder pain. J Pain. 2009;10(3):293–299. Block PR, Thorn BE, Kapoor S, White J. Pain catastrophizing, rather than vital signs, associated with pain intensity in patients presenting to the Emergency Department for Pain. Pain Manag Nurs. 2017;18(2):102–109. Kjøgx H, Kasch H, Zachariae R, Svensson P, Jensen TS, Vase L. Experimental manipulations of pain catastrophizing influence pain levels in patients with chronic pain and healthy volunteers. Pain. 2016;157(6):1287–1296. Rakel BA, Zimmerman MB, Geasland K, et al. Transcutaneous electrical nerve stimulation for the control of pain during rehabilitation after total knee arthroplasty: a randomized, blinded, placebo-controlled trial. Pain. 2014;155(12):2599–2611. Noehren B, Dailey DL, Rakel BA, et al. 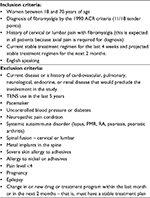 Effect of transcutaneous electrical nerve stimulation on pain, function, and quality of life in fibromyalgia: a double-blind randomized clinical trial. Phys Ther. 2015;95(1):129–140. Merriwether EN, Rakel BA, Zimmerman MB, et al. Reliability and construct validity of the Patient-Reported Outcomes Measurement Information System (PROMIS) instruments in women with fibromyalgia. Pain Med. 2017;18(8):1485–1495. Jensen MD, Ryan DH, Apovian CM, et al; American College of Cardiology/American Heart Association Task Force on Practice Guidelines; Obesity Society. 2013 AHA/ACC/TOS guideline for the management of overweight and obesity in adults: a report of the American College of Cardiology/American Heart Association Task Force on Practice Guidelines and The Obesity Society. Circulation. 2014;129(25 Suppl 2):S102–S138. Patient-Reported Outcome Measurement Information System. Available from: https://www.assessmentcenter.net/documents/PROMIS%20[Anxiety]%20Scoring%20Manual.pdf. Accessed August 30, 2018. Sullivan MJL. The Pain Catastrophizing Scale. User Manual. Montreal, QC: McGill University; 1995:22. Bennett RM, Bushmakin AG, Cappelleri JC, Zlateva G, Sadosky AB. Minimal clinically important difference in the fibromyalgia impact questionnaire. J Rheumatol. 2009;36(6):1304–1311. Maetzler W, Klenk J, Becker C, Zscheile J, Gabor KS, Lindemann U. Longitudinal changes of nerve conduction velocity, distal motor latency, compound motor action potential duration, and skin temperature during prolonged exposure to cold in a climate chamber. Int J Neurosci. 2012;122(9):528–531. Lévêque JL, Dresler J, Ribot-Ciscar E, Roll JP, Poelman C. Changes in tactile spatial discrimination and cutaneous coding properties by skin hydration in the elderly. J Invest Dermatol. 2000;115(3):454–458. Vance CG, Rakel BA, Dailey DL, Sluka KA. Skin impedance is not a factor in transcutaneous electrical nerve stimulation effectiveness. J Pain Res. 2015;8:571–580. Boada MD, Eisenach JC, Ririe DG. Mechanical sensibility of nociceptive and non-nociceptive fast-conducting afferents is modulated by skin temperature. J Neurophysiol. 2016;115(1):546–553. Kemp J, Després O, Pebayle T, Dufour A. Age-related decrease in sensitivity to electrical stimulation is unrelated to skin conductance: an evoked potentials study. Clin Neurophysiol. 2014;125(3):602–607. Chakour MC, Gibson SJ, Bradbeer M, Helme RD. The effect of age on A delta- and C-fibre thermal pain perception. Pain. 1996;64(1):143–152. Humes LE, Busey TA, Craig JC, Kewley-Port D. The effects of age on sensory thresholds and temporal gap detection in hearing, vision, and touch. Atten Percept Psychophys. 2009;71(4):860–871. Stuart M, Turman AB, Shaw J, Walsh N, Nguyen V. Effects of aging on vibration detection thresholds at various body regions. BMC Geriatr. 2003;3:1. Namer B, Barta B, Ørstavik K, et al. Microneurographic assessment of C-fibre function in aged healthy subjects. J Physiol. 2009;587(2):419–428. Cramp FL, McCullough GR, Lowe AS, Walsh DM. Transcutaneous electric nerve stimulation: the effect of intensity on local and distal cutaneous blood flow and skin temperature in healthy subjects. Arch Phys Med Rehabil. 2002;83(1):5–9. Fietta P, Fietta P, Manganelli P. Fibromyalgia and psychiatric disorders. Acta Biomed. 2007;78(2):88–95. Hofmann SG. Cognitive processes during fear acquisition and extinction in animals and humans: implications for exposure therapy of anxiety disorders. Clin Psychol Rev. 2008;28(2):199–210. Vlaeyen JW, Linton SJ. Fear-avoidance and its consequences in chronic musculoskeletal pain: a state of the art. Pain. 2000;85(3):317–332. Vlaeyen JW, Linton SJ. Fear-avoidance model of chronic musculoskeletal pain: 12 years on. Pain. 2012;153(6):1144–1147. Ehde DM, Dillworth TM, Turner JA. Cognitive-behavioral therapy for individuals with chronic pain: efficacy, innovations, and directions for research. Am Psychol. 2014;69(2):153–166. Abbreviations: ACT, American College of Rheumatology; PMR, polymyalgia rheumatica; RA, rheumatoid arthritis; TENS, Transcutaneous electrical nerve stimulation.